Oh yes. Now you’ve put your finger on it. Rust make them structurally weak but oh so full of legends and tales. New will be crisps and shiny. Yes, rust has its charm in different ways, there’s no doubt about that. I find photographs of rust intriguing … especially when close. This one is wonderful with the contrast of the water and sky. Beauty, serenity, danger — all in one, and such great art to admire. Some gorgeous rusty tones there! Great picture. Great title. I also like to incorporate rust in some photos. 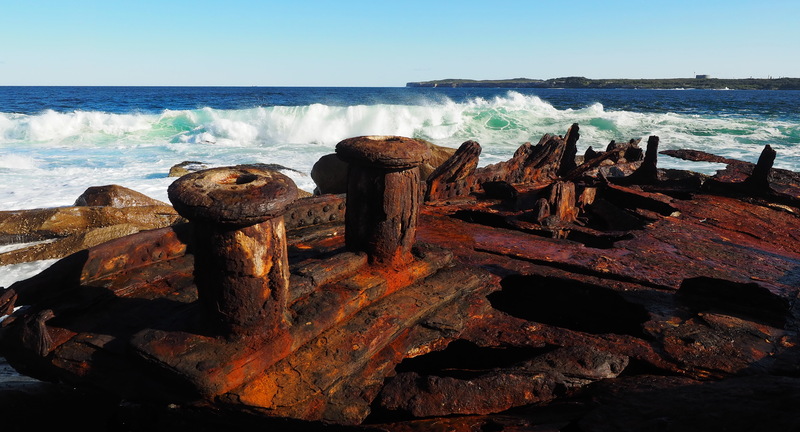 The contrast of the waves and rust in your photo.. excellent. I love the contrast of red rust against the clean blue of the sea!